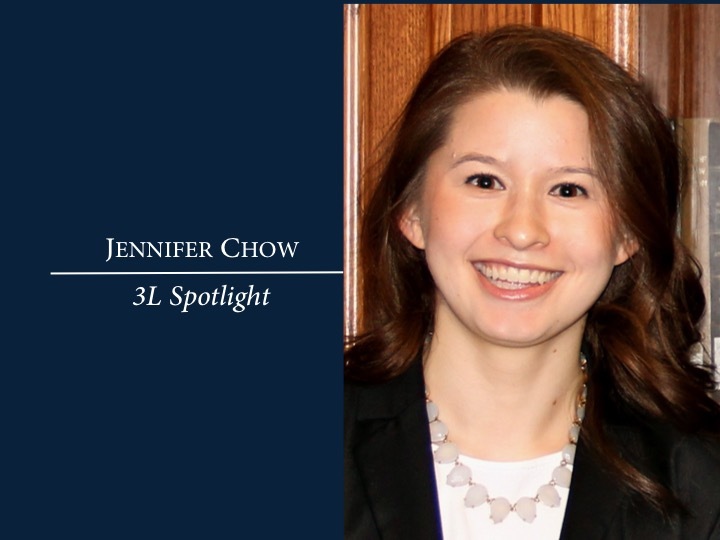 Jennifer Chow graduated from DePaul University College of Law this May from the dual degree program, earning both a Juris Doctor degree and a Masters of Law in Health Law. Jennifer, or more commonly known as Jen to her friends, shared with the E-Pulse her interest in health law, experiences during law school, and advice for future health law students. Jen graduated from the University of Southern California with a Bachelor of Arts in Psychology, Communication, and a minor in Advertising. During her undergraduate career, Jen took a few courses that focused on the legal aspects of freedom of speech that peaked her interest in the law. Upon graduation, Jen worked in advertising for about a year, after which she decided to pursue her legal education. Raised by parents working in the medical field, Jen found her interest in health law early. Presented with the opportunity to facilitate the growth of the Jaharis Health Law Institute, Jen stepped into a Board Member position on the Student Advisory Board at the end of her first year in law school. She was appointed Editor-in-Chief of the resurrected Health Law Institute Newsletter, renaming it the E-Pulse, to signify the new era of change for the Institute. Under Jen’s direction, the E-Pulse, continues to expand and grow its numerous subscriber base. Additionally, Jen has been an active member of the Journal of Health Care Law and was elected Business & Managing Editor in her 3L year. Jen emphasized the importance externships and clerkships played in her health law education. During her time at DePaul, Jen has focused her studies on health care issues for a range of entities, includingnon-profit, for-profit, government, and in-house. From her 1L summer through the Fall semester of her 2L year, Jen externed with the Office of Legal Affairs at Presence Health. During her experience with Presence Health, Jen not only acquired much practical experience and substantive knowledge, but also found her passion for in-house work and the protection of health care providers. Jen subsequently worked for the Governor’s Office of Health Innovation and Transformation, clerked for Kamensky Rubinstein Hochman & Delott, LLP, and clerked for Goldberg Law Group. In the Fall of her 3L year, Jen happily accepted Presence Health’s invitation to return as a clerk to the Office of Legal Affairs. Jen recommends that current students remain open-minded to different fields of work, get as much varied experience as possible, and find work that they are proud to do everyday. Jen is taking the Illinois bar exam in July and has not yet finalized her future plans. Her goal is to ultimately work in-house for a health care provider, but anticipates a few career changes along the way.